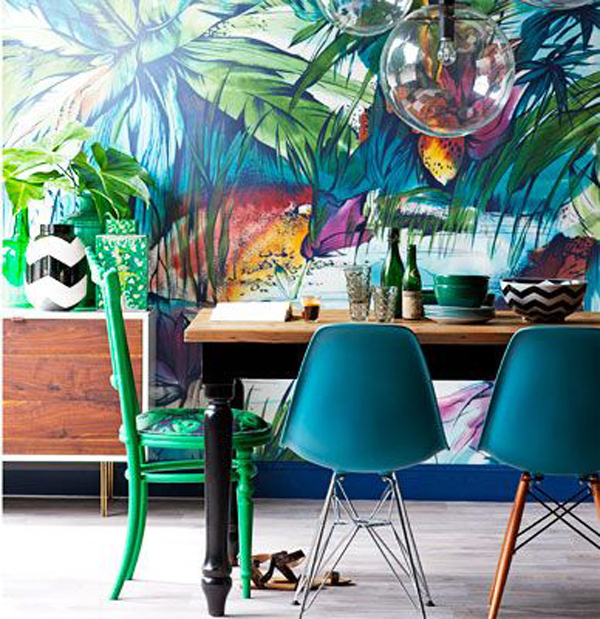 From parrots to palm trees this trend is sure to brighten up your home! This palm tree wallpaper creates a strong style statement when teamed with accessories in co-ordinating colours and a mix of wood finishes. These Eames inspired Eiffel DSW chairs shown here in Blue are one of the must have pieces for the year and work with almost any trend. This wall mural is more toned down than some of the tropical style wallpapers we’ve seen. This look is kept very natural with the rustic style table and chairs and plants. Scatter cushions are great if you don’t want to redo your whole room, and are easily changeable when you want to update the look. 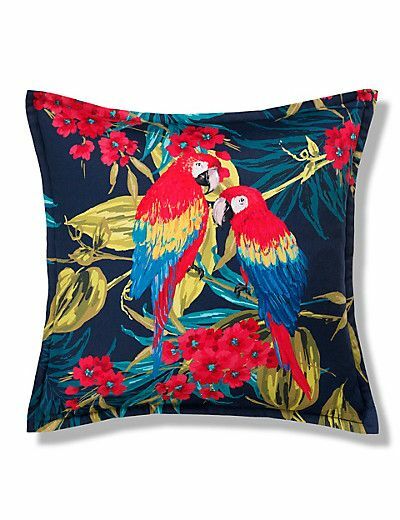 We love this deep blue cushion with bright bold parrot and floral motif. Ok, so pineapple ornaments may be a throwback to the seventies, but this is a much more sophisticated way to incorporate the trend. You can find accessories like these in block colours quite easily but if you would like to add your own touch why not spray paint the bottom and fade upwards like the one above. This trend is all about being daring with colour and patterns so can be a little daunting for most. We would suggest keeping these bold prints and colours to cushions, throws, artwork, and accessories in order to match to your upholstery. If you would like any help with updating any fabrics in your home, a Plumbs Home Consultant will be able to advise on the best options for you, all in the comfort of your own home and for free.